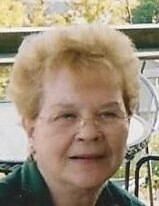 Hazel G. Vanek (nee Hughes) 90 of Whiting, passed away peacefully on the evening of Saturday, March 30, 2019 at her residence. She was the beloved wife of the late John G. Vanek who passed away on May 4, 2007. She is survived by her brother, Kenny (Martha) Hughes; numerous nieces and nephews and special friends, Joe Griffin, Don Kuzevich and Mary Ellen Bucsanyi. Funeral services will be held on Wednesday, April 3, 2019 at 10:30am at the Baran Funeral Home, 1235-119th St., Whiting; a Mass of Christian Burial will be offered at 11:00am at Sacred Heart Church, Whiting, with the Rev. Mark R. Peres, C.PP.S., officiating; interment, Calumet Park Cemetery, Merrillville; visitation at the funeral home on Wednesday morning from 9:00am to time of services. Hazel Vanek was born on October 13, 1928 in Shawneetown, Illinois to Milas and Isabelle Hughes and was a resident of Whiting for over 60 years. A licensed beautician, Hazel owned and operated Hazel’s Beauty Shop on 119th St in Whiting for many years. She was a member of Sacred Heart Church, Whiting, the Sacred Heart Rosary Society and the VFW, Walter Kleiber Post 2724 Women’s Auxiliary. She enjoyed playing bingo, gardening and trips to Las Vegas. Hazel will be sadly missed by all who knew and loved her. In lieu of flowers, memorials to the St. Joseph Carmelite Home, East Chicago would be appreciated.